Do you remember two days ago, when I was complaining that Copper Canyon was not as beautiful as I thought it was going to be? Well, the motorcycle ride today made of for all of that. 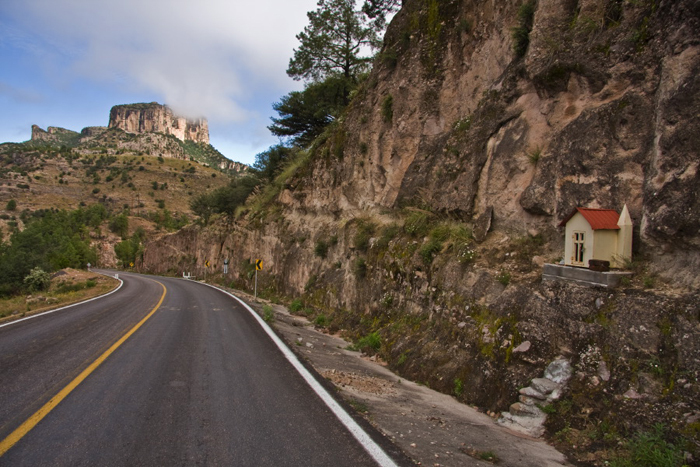 I think I need to go out on a limb and state that the road from Creel to Hidalgo de Parral is one of the most beautiful rides in the world. Ok, Ok, yes I know, there are lots of beautiful rides out there, but what made this one so wonderful is the change in climates as it winds from mountain to high plains desert. As I left Creel, I followed the road south, along the soft flowing valleys, with the pine trees and the giant collections of stones. But this ended, and the canyons began. I kept stopping to take pictures, but the view in the little square lens of the camera could not explain what I was seeing. A winding two-lane road. At some moments with cliff faces on the left and deep chasms on the right leading to grey boulders strewn riverbeds. But is also wound around monolith plateaus standing erect like that mountain in Close Encounters of the Third Kind, but with green shrouding the bottom and capping the top. I did stop along a sheer cliff wall and too a picture of one of the many shrines. This one set in the cliff face itself. While I was pondering the view, a gaggle of motorcyclists passed on the road below. I waited and they arrived at my little turn off. They were all on BMW’s and they were all somewhat local. We chatted for a while, about bikes and riding and they asking me, over and over again, Isn’t Mexico the most beautiful country? And I kept agreeing with them, hiding my disappointment with Copper Canyon. 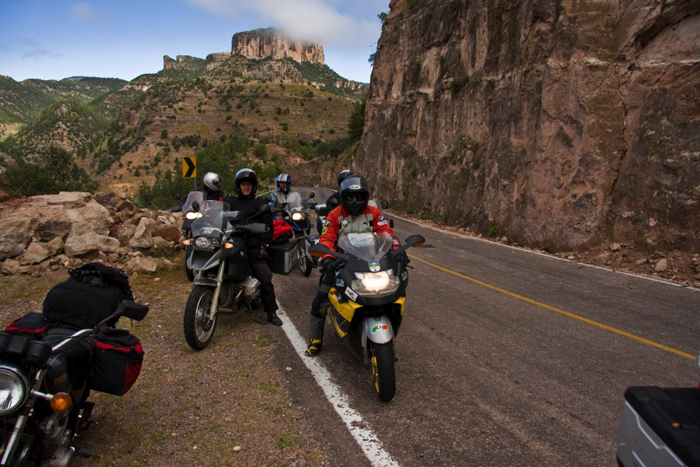 For the next few miles, I followed them through the winding road, marveling at the beauty, until they finally got sick of me traveling so slowly, (Hey I got a 30 year old bike, compared to their new BMW’s) and they headed south to the BMW convention in Guadalajara on Oct 15. I passed the entrance to a place called Batapilas, where Plaid told me to stop and wonder at the out of time church. But at the exit the river was flowing with force, and there was no bridge, just the road which the river flowed over, not under. Description or not trusting my bike in the water, told me to continue on. Ok, now back to trying to describe the ride. After the canyons the land flattened out into farm country. The edges of the road were lined with barbed wire fence, with grazing land and farmland. I tried to figure out what they were growing, but I was lost other than corn. The horses and cows and donkeys were out and about on this chilly sunny day. Farm machinery slowing crawled up the road. The speed limit was 80kph and I kept up a pleasant 60mph. Some of the road signs were obvious, ‘Curva Peligrosa’ with an arrow and a slower speed rating. But my favorite, and I don’t know why I think this is so cool, but it directly translates to ‘This is not the road of maximum velocity’. I don’t know, maybe it has some sort of science fiction feel to it. But it made me smile every time I saw it. Finally, after 100 miles from Creel, there was a gas station. I was getting nervous. Crossing the California desert my bike stalled at 118 miles, forcing me to turn on the reserve tank. I did not want to run out of gas in the middle of nowhere Mexico. The long farming valleys ended in a small section of broken up rocky terrain to come out on a wide valley again. And again, I don’t know how to describe the beauty and majesty. My first thought was that it used to be a great plain, and I was standing on the edge of it. But over the past million years the river had carved its way through it. And so standing in the middle of the river valley, were these monoliths. 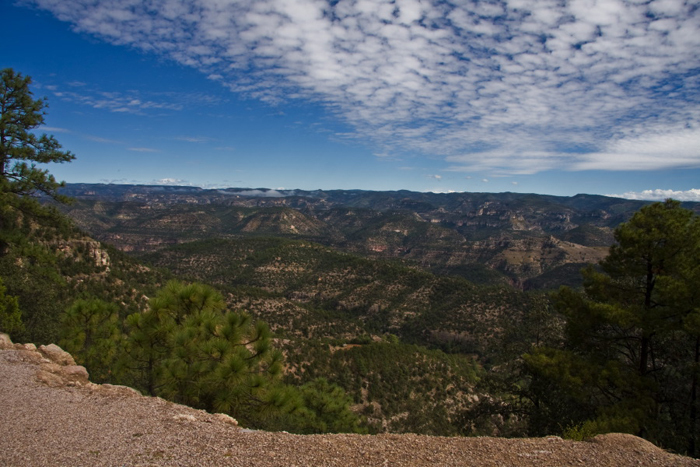 They look like the monoliths in the Arizona desert, hundreds of feet tall, rocky sides and perfectly flat tops. But unlike the Arizona desert, these were green. The trees and shrubs crawled up the sides until they could not find footholds in the sheer rock. But the top was glowing with life. 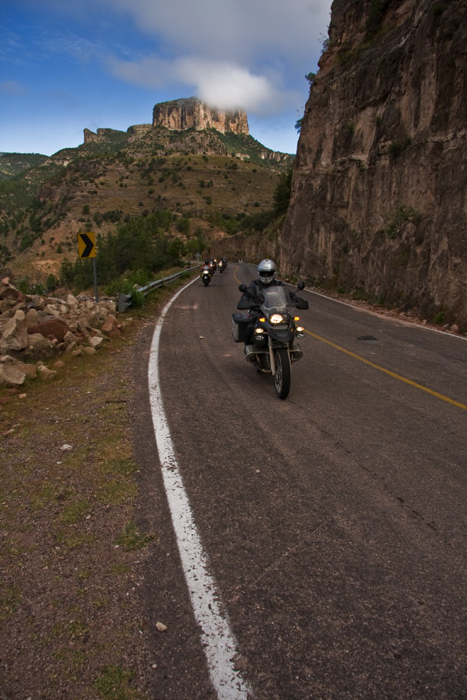 And me, on my tiny motorcycle, riding on this thin pencil line of road, follow the edge of the monoliths into the valley. There is no one else on this road, just the occasional truck belching black smoke. The grass stands high by the side of the road, and increasing wind blows it in waves like the sea. In the distance are dark rain clouds, but here it is sunny and the monoliths throw shadows on the trees and fields below. The road continues to pitch and wind through smaller and smaller mountains. But the rain is here, and on slips the wet weather trousers and it rains intermittently the last 30 miles to Parral. Finally I arrived in Hidalgo de Parral. It is not very inspiring arriving in a new town on a motorcycle. Because the outskirts are always filled with the dirty industrial parts of the town, the automobile and truck repair shops, the concrete makers, the waste land filled with trash, this is where the trucks belch most of their smoke and the cars speed in every direction. There was a problem upon arriving in a new town with my backpacking guide. And it was just this, it was a backpacker’s guide. It told how to get to the hotels from the bus station or the train station usually without a map. And there was no mention if the hotel had parking. The first thing to do is ride the bike around lost, trying to find the town center or a bus or train station. In small towns this is fine, but not for larger cities. My eyes were constantly scanning for center of town things, like big churches, large town squares, and the always popular sign pointing toward the town center. Stuck in the afternoon rush hour traffic I noticed two non-Mexican dual sport motorcycles trying to pull out. I let them pull in front of me. As they did I let out a soft exclamation upon seeing their license plates. We stopped and chatted, and they lead me to their hotel. They’re from England, one from near Cambridge, and one living in Sweden (?). Their names are Matt and Steward, (I can remember that I said to them, my best friend and my cousin). We went out for dinner, and chatted about life. One was riding all the way from Alaska to the tip of South America, the other, recently married, met the other in Los Angeles and they were traveling south together. We drank Modelo beers and ate tortas and tacos and quesadillas. 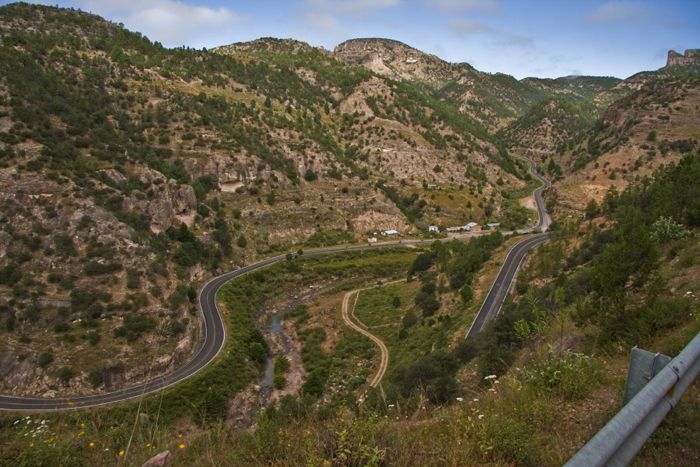 We discussed motorcycles and agreed that the ride from Creel was one of the most beautiful in the world. We finished the night on the roof of the hotel drinking beer, and I realize now that I owe them a beer. In the morning they headed off on their 650 Yamahas (I don’t remember the model type, but they were not more than a year or two old) and I stayed an extra day in Parral. Useless fact #394: the name Parral is pronounced Parra, without the L and if your tongue can do it, roll the rr’s.